The second week of LitCamp was Mad Scientist week, and everyone embraced the theme wholeheartedly. During our Tuesday morning meeting, each bunk – a group of five children and their LitCamp leader – created a Curious Commercial. The commercials advertised an original invention based on pictures of random items, which in all honesty, didn’t appear to have any practical use or purpose. Of course, the creative LitCampers eagerly tackled the challenge! My group advertised Don't Touch Me Hands, for those times when you have to be polite and shake hands but the other person isn't your favorite (Lokie and Ironman from the Avengers show how useful this invention would be). Salpi's group had a genius idea, and made the Zipchine, which monitors the oil levels and heart functioning of the mechanical Venacafians, who inhabit the country they created during International Week. Eric's group introduced something I definitely need: a voice-activated key holder. The "O Key C" can give you the key to whatever you must unlock, for just $19.95! Finally, Lizzie and her group showed us the Magic Doorknob that can take you anywhere – oh the possibilities! All the campers did an amazing job, committing to their performance and chasing their curiosity. We also ran some great classes during the week. We had the usual favorites like newspaper and pool (this time called "H2O" to keep with the Mad Science theme). Additionally, we had some new options like Animal Behavior, Space and Disasters, Edible Experiments, Mad Arts and Crafts, and Brainiacs Attack. 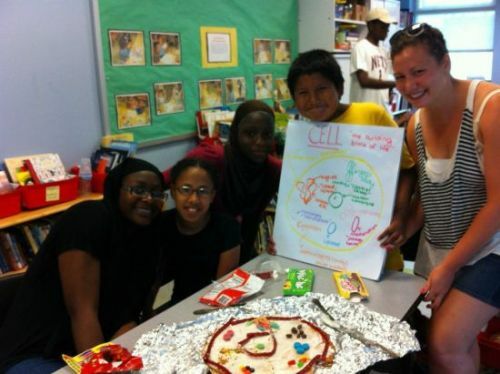 Nina, a great friend of LitWorld, even led a forensics class! 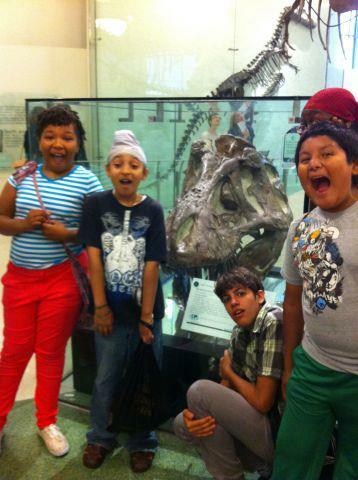 A major highlight of the week was our trip to the Museum of Natural History. We got to see some really cool exhibits. The bioluminescence exhibit was a crowd favorite! We got to see all kinds of plants and animals glow, from fireflies to jellyfish. We also learned a lot about space, and how the universe has changed and will continue to change. We stood around a massive round screen to watch a video on the Big Bang Theory which really made you feel like you were moving through space. After, we had so much fun wandering among skeletons of a Brontosaurus, T-rex, and other huge dinosaurs. Overall, the second week was a smash! Everyone got a taste of what it would be like to be a mad scientist. Everyone had a chance to learn something new, whether we were making fingerprints, constructing a volcano, or eating an edible cell. Mad Scientist Week was a wacky, wonderful success!